Delhi University has announced the DU LLB Entrance Exam Important Dates for the year 2018. It's high time to steel yourself for the DU Law Entrance Exam. Delhi University is one of the largest universities in India and one par excellence for Law Degree. DU LLB Entrance Exam is conducted every year and screens students who wish to study in the law colleges affiliated to the university. DU LLB entrance exam is the gateway to three law colleges affiliated to Delhi University namely Campus Law Centre, Law centre-I and Law Centre-II. The DU LLB Important Dates 2018 are the same for all these colleges as there will be common entrance exam i.e. the DU LLB exam on the basis of the scores of which these seats are filled. Now let us move to DU LLB important dates. Read forth carefully and mark the DU LLB important dates 2018 notified by the university for its much sought after law course. These 7 steps cover all DU LLB Important Dates but these DU LLB important dates 2018 are tentative and can be changed if deemed fit by the University at anytime on the discretion of the convening body that is the Delhi University. These changes will be notified on the official website of the university. Candidates must fill the DU LLB Application Form within the date prescribed. 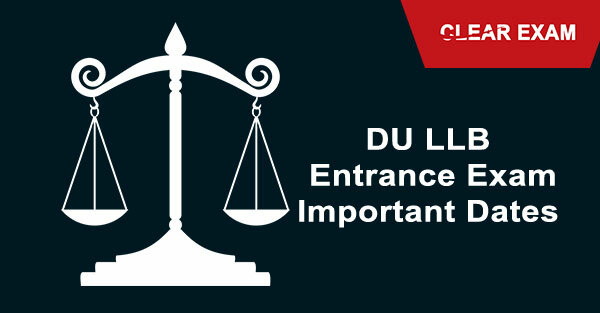 Read DU LLB Entrance Exam details here. Go through the post to know the DU LLB Important Dates 2018.